The Kramer 8x8 RGBHV & Balanced Stereo Audio Matrix Switcher allows you to switch between 8 high-resolution RGBHV video and balanced stereo audio inputs and 8 outputs independently. Using the high-performance switcher, you can route any or all of the inputs to any or all outputs simultaneously. It supports 3 high bandwidth video channels (Red, Green, and Blue) and 3 TTL (logic level) channels with Horizontal and Vertical sync. In addition it allows mixed video application usage, such as CV, Y/C, and YUV. Innovative Kr-isp technology allows integrated sync processing by restoring sync signal waveform to provide you sharp, stable images even during low sync levels. In addition to HDTV compatibility, the 8 x 8 RGBHV & Balanced Stereo Audio Matrix Switcher features video bandwidth of over 350 MHz (-3dB) fully loaded. You can recall and execute common video and audio configurations and audio gain status for each output using the preset memory locations. With the Take Button you can execute multiple switches simultaneously. Front Panel Lockout prevents tampering. Analog Audio Breakaway Switching helps in switching audio independently from video. Audio Gain Level Controls can be used to adjust gain signal level of each input and output and match it with various other sources. In addition, the 8 x 8 RGBHV & Balanced Stereo Audio Matrix Switcher features Vertical Interval Switching that permits switching during the vertical interval to ensure glitch-free switching with genlocked sources. 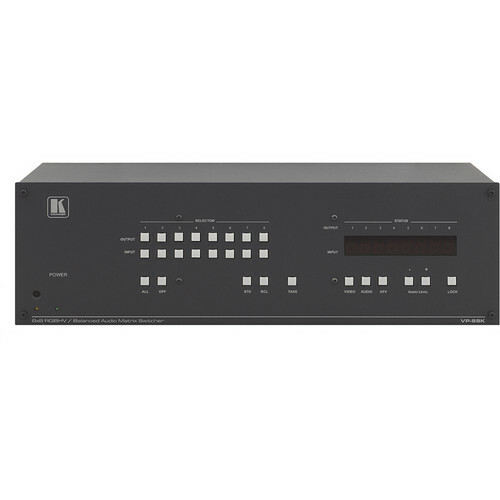 The 8 x 8 RGBHV & Balanced Stereo Audio Matrix Switcher can be controlled using the front panel buttons or remotely via RS-232, RS-485, Ethernet, IR remote control or an external IR remote receiver. It has a standard 19" rack mount size, fits 3U rack space, and requires 100-240V AC power supply.